Sorry, I forgot to post yesterday! My other two reviews aren't finished, so let's talk new stuff. That's right, talk of the 2019 ice cream season has begun. Now, I don't know where candy hunting gets most of her news, but I do know where the Mars stuff comes from (aka candy bar ice creams and Dove branded frozen treats). So what did they announce the other day? 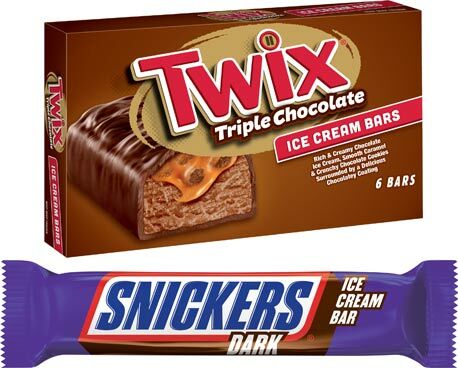 The focus of the press release are the Snickers Dark Chocolate Ice Cream Bar (peanut butter-chocolate ice cream that's dipped in dark chocolate) and the Twix Triple Chocolate Ice Cream Bars (chocolate ice cream, caramel, and crunchy chocolate cookies in a chocolatey coating). I pretty much like all of their other ice cream bars so I can't imagine not liking these as well. Now if you scroll all the way to the bottom of the press release, there is actually one more product line that is coming up but not pictured. It's Dove Gelato Bars! That's right, they've decided to jump in the the gelato game with the Dove name. There are only two flavors to start: salted caramel and triple chocolate. I will admit that this surprises me a bit in a time when everyone else has been jumping on the sugar replacement bandwagon. Be thankful for small miracles that we weren't give a zero sugar snickers bar or something. Wait, wait wait, I just did a bit of digging and figured out where the new Magnum tub news came from. It looks like a few grocery stores set the SKUs up a little too early. The three flavors are Dark Chocolate Mint (peppermint ice cream with dark chocolate), Milk Chocolate Almond (vanilla ice cream with almonds and milk chocolate) and Milk Chocolate Mocha (coffee ice cream with milk chocolate). Now remember that these tubs can be found all over the planet so places like Australia already has the almond flavor. That said, it appears the mint and mocha flavors might be something new this year. I wonder if I will find these in December again? -UPDATE- I found these already!!! I ran in to Wegman's this morning (10/8) and found the almond and mocha flavors (with a spot left for the mint). No one so many grocery stores have these posted already... do these even count as a 2019 product then? You know these magnum pints remind me of the old Godiva pints from the early 2000s. Yeah, they're pretty fancy. They also take the chocolate on top idea from the old Dove ice cream pints.